iTunes Seller:Seller: Ambient Design Ltd.
ArtRage doesn't just place color on your canvas. It keeps track of how much paint there is and how wet it is, so you can blend color under the brush as you paint, or lay down thick lines of pigment for smearing with the Palette Knife just like the real thing. Watercolors react to the wetness of the brush and paper, to create hard edged strokes or blend to soft gradients. Canvas grain affects the paint, and dry pigments break up on the surface to create textures. It's not just a special effect, it's a live simulation of the properties of real paint. Come join the ArtRage community! Real world painting tools include Oils, Watercolor, Paint Rollers, Pencils, Crayons and more. Each tool has a range of settings that reflect familiar properties such as how much thinner is applied to the paint, or how soft a pencil tip is. Tools apply texture as well as color, and blend under the brush. Import photos, converting them to oil for smearing or as Reference Images pinned to the canvas as a visual guide. You can load photos as Tracing Images which are overlaid on the canvas, and have ArtRage select colors from them automatically as you paint. The interface has been designed specifically for the iPad, compacted to maximize your creative space without hiding away critical functions such as tool and color selection. As you paint, it gets out of the way so that you don’t have to stop and manually adjust panels. With support for Multi-Touch gestures, important shortcuts are available without needing any interface. - Oil Brush, Watercolor, Airbrush, Palette Knife, Paint Roller, Paint Tube, Inking Pen, Pencil, Marker Pen, Chalk, Crayon, Eraser, Flood Fill. - Unlimited layers, Photoshop standard blend modes, visibility and opacity controls. Scale, rotate, and position layer contents independently. - Record your paintings then play them back in a desktop version of ArtRage Studio or Studio Pro at higher resolution. Note: Studio does not support some palette knife features present in the iPad version. - Unlimited Undo / Redo. Load photos as References or Tracing Overlays. Store as many color samples as you want for later use. 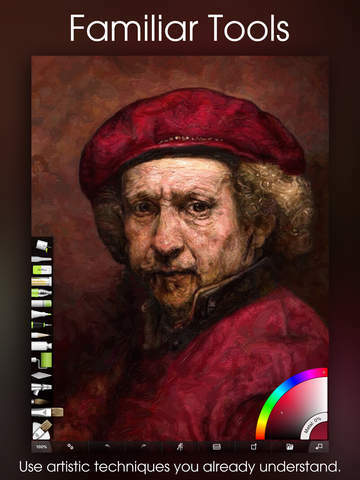 - Create paintings up to 1440 x 1440 on iPad 1, 2048 x 2048 on iPad 2 or later. Uses iTunes shared file space so you can share files with your desktop computer. Export JPG or PNG by email, or export to your Photos App. Upload directly to Facebook or deviantArt. Import photos to a new file or a layer, with camera support. - Full support for Retina display iPads. Supports all screen orientations. Easy access pods provide convenient functionality without getting in the way. Elements vanish as you paint so you can paint underneath without having to stop. Multi-Touch shortcuts for canvas manipulation, Undo/Redo, and Brush Size. - Quick Reference and Guide cover the basics of the application. Free product support available via our Forums or by email to our support team. Your mobile device must have at least 15.05 MB of space to download and install ArtRage app. ArtRage on sale for only $1.99! Download it from iTunes now to save money. Hurry in for the deals, they are updated daily. If you have any problems with installation or in-app purchase, found bugs, questions, comments about this application, you can visit the official website of Ambient Design Ltd. at http://www.artrage.com/artrage-ipad.html. Copyright © 2011 Ambient Design Ltd. This update fixes problems with restoring gallery backups, issues that could arise when working with an empty gallery, problems with the gallery Options menu when displaying in page mode, and some issues with ink pen tapering and pressure support. As always, if you find a problem please let us know via our support link or forums, we're always happy to help! Updated For iPhone X: We've gone through the app and updated layouts to make sure that everything is in the right place and accessible on iPhone X. - Fixed a crash that could occur when importing reference images on iOS10. - Fixed a crash that could occur when pasting content copied from a hidden layer. - Added ink back to painting titles in the gallery so they're not white any more! Just a quick update to address a hang on start that could happen if files were in the shared file space and the app thought it needed to do a first time reinstall. As always, if you find a problem please let us know via our support link or forums, we're always happy to help! • iOS11 Files app support for ArtRage files. •Drag / Drop Layer, Reference, and Tracing Image assignment from Files and other image applications that support drag. •iOS level PTG file thumbnails and Quicklook support. •Updated sharing system that allows import/export via any app or service on the device that supports file sharing, including iCloud Drive. If you have any problems with these or any other features please let us know via our support page and we'd be happy to help! • Fixed a problem that prevented export to Facebook, Twitter, and Dropbox. • Added wait indicators for longer import operations. • Added a Pressure slider to the ink pen. • Adjusted the Tool Settings panel so that it can scroll on smaller devices. • Fixed a bug that prevented the precise colour picker from functioning correctly when Tint/Tone mode was active. • Fixed a bug that caused the screen to slide up when editing the size of paintings in landscape mode on devices that had a hardware keyboard attached. - Fixed a crash that occurred for some users when entering the gallery on iOS8 or 9. - Fixed a problem that could cause the save prompt on iOS8 to appear too small to hold its various buttons. - Fixed a bug that could prevent the restoration of backed up galleries. - Fixed a bug that causes Page View painting previews on iOS10 to sometimes appear with a small preview based on collection view caching. As always, if you find a problem please let us know via the Feedback button in the app, we're always happy to provide support and look in to anything that might be going wrong! Updated for iPad Pro, Apple Pencil, and iOS 9. Includes larger canvases and tools, iOS9 Split screen support, and Tilt and Pressure support for Apple Pencil to further enhance the realism of our virtual painting tools. 2.1 also includes a large number of performance and memory enhancements along with fixes and other new general features. As always, if you have a problem contact us for support, we actually listen and can almost always solve it for you! • This 2.1.1 update includes some Preset Picker changes to address some problems we've seen reported when selecting tool presets. • Added Pressure and Tilt support for Apple Pencil and enhanced various tools to simulate the angle of the virtual brush head. • Increased maximum canvas size on iPad Pro to 4096 x 4096 and added presets for 4k resolution. • Increased the maximum size of various tools on iPad Pro for the new canvas sizes. • Added support for Split Screen functionality to the app. • Added Paint Loading to the Palette Knife tool in Flat and Edge modes. • Added the option to rotate the canvas, along with an optional toggle to limit rotation to 15 degree increments. • Added the option to have popup panels (Layers, Settings etc.) auto dismiss when you start painting. • Added non-uniform scaling to Layer Transform. Use the menu in the Transform view to turn on Stretch then scaling from the edges of the object will scale on that axis only. Scale from the corners when in this mode to scale uniformly. • Added the ability to 'Hide Upper Layers' in the Transform view. • Added a recovery button when the toolbar is hidden. • Added a visual selector for Wacom Stylus hand angles. • Improved stylus support across the board to remove erroneous gestures, add touch rejection, and support the latest iteration of SDKs including coalesced input point values. Updated Wacom Intuos Creative Stylus Support for new stylus models including the Bamboo fineline and Intuos Creative Stylus 2. This build adds support for the stylus Left Handed mode. To turn it on go to the ArtRage Preferences section of the Settings App on your iPad. If you experience a problem with ArtRage, let us know using our support link (we're not able to respond to issues listed in reviews here), or the ArtRage Online link in the product itself. We're happy to work through problems with you and in most cases we can quickly resolve the issue. Speed issues or crashing can usually be resolved quickly and easily by closing parked apps and rebooting your iPad, we provide instructions in our Forums, but in other cases we can use crash logs generated on your iPad to track down the exact cause of a problem and produce a fix. Many of the fixes listed in this update came about thanks to users who had problems getting in touch with us, so don't hesitate to get in touch.